Present this Haldirams Bits-of-Pleasure Gathering to your endeared ones and drench them with your sugary fondness. This Gathering is decked with 250 gm Haldirams Soan Papdi (Gross Weight), 250 gm Haldirams Bhujia (Gross Weight), 250 gm Haldirams Kaju Pista Roll (Gross Weight), 250 gm Assorted Dry Fruits (Gross Weight), 5 pcs Homemade Chocolates and 3 pcs Homemade Chocolates in a Heart Shaped Box. 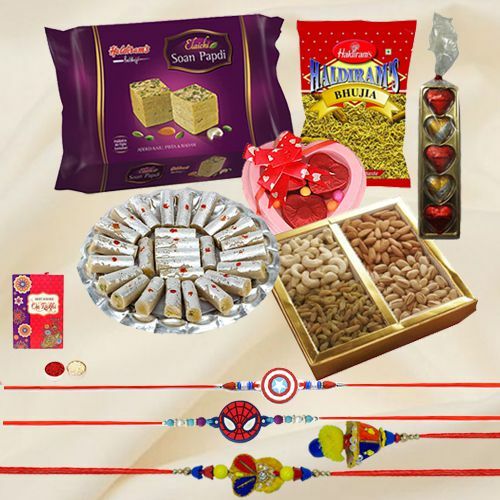 Haldiram Fun-to-Much Ensemble of - 500 gm Haldirams Soan Papdi (Gross Weight), 250 gm Haldirams Bhujia (Gross Weight), 250 gm Haldirams Kaju Pista Roll (Gross Weight), 250 gm Assorted Dry Fruits (Gross Weight), 5 pcs Homemade Chocolates and 3 pcs Homemade Chocolates in a Heart Shaped Box with Family Rakhi Set (1 Pair + 2 Kids) and Roli Tilak Chawal. Haldiram Fun-to-Much Ensemble of - 250 gm Haldirams Soan Papdi (Gross Weight), 250 gm Haldirams Bhujia (Gross Weight), 500 gm Haldirams Kaju Pista Roll (Gross Weight), 250 gm Assorted Dry Fruits (Gross Weight), 5 pcs Homemade Chocolates and 3 pcs Homemade Chocolates in a Heart Shaped Box with Family Rakhi Set (1 Pair + 2 Kids) and Roli Tilak Chawal.